As I write, I'm listening to a new album, new to me that is. The album is, Falling In Love With Jazz, by Sonny Rollins. I don't normally listen to jazz. Let me correct that statement. I never listen to jazz. At least not since a friend, more than fifty years ago, force fed Dave Brubeck to me as I protested and screamed, "Little Richard is better." The Brubeck forced feeding didn't take. I still prefer Little Richard. And until now, I have not intentionally listened to jazz. Why change now? That's simple. Another friend told me about Falling In Love With Jazz. He didn't try to force feed it to me. He just casually mentioned the album as he described his partner's apartment. That casual comment prompted a visit to iTunes, where I sampled and then purchased the album. As my friend, Harry Bosch, continued to describe Eleanor Wish's home, he casually mentioned her framed print of Night Hawks, painted by Edward Hopper. I'd never heard of Night Hawks either. So, at the first opportunity, I cranked up my laptop and Goggled the painting. I discovered that Night Hawks is famous, in public domain, and that the model for the redhead was the painter's wife, Jo. Night Hawks, the original painting, resides at the Art Museum of Chicago, where it has been since it was painted, in 1942. Harry said that when he first saw the painting in Chicago, he stared at it for almost an hour. Like Harry, I stared at the virtual depiction of Night Hawks on my computer screen for a long time. Unlike Harry, who identified with the man sitting alone at the counter, I identified with the man with the beautiful redhead because I'm married to a beautiful redhead. 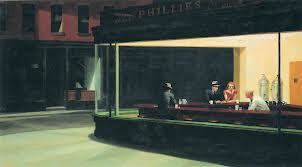 Regardless of our different perspectives regarding the painting, like Harry, I find Night Hawks captivating. He mentioned one other thing as he told me about Eleanor's living room. He said that he pulled a copy of The Locked Door, by Edna Roughley, from Eleanor's bookcase and added that he had always wanted to read it but never found a copy he could buy. Harry added that he opened the book and read, "Eleanor D. Scarletti," and determined Eleanor had kept her former husband's name after their divorce. Then he said he returned the book to the shelf, but he didn't say whether he has since read it. Harry had peaked my interest so that when he left, I Goggled Edna Roughley and discovered she was an Australian writer who was well known in the nineteen forties and is almost forgotten today. Thanks to modern technology and Abebooks.com, I now own a copy of the book which will be shipped from Australia tomorrow and in my hands in ten days. I'll read it as soon as it arrives, and then I'll wait for Harry to mention it again. When he does, I'll just smile, knowing I'm finally one up on him. You should know this about Harry Bosch, if you don't already, he is a Vietnam Vet, a Los Angeles, California, police department detective, and a man with a double shot of personal integrity. He is also the creation of Michael Connelly, who has charted Harry's life in nineteen novels. At least, that's who Harry Bosch is to Michael Connelly, but that isn't who Harry Bosch is to me. Harry Bosch is a man I can count on, someone I share values and back stories with. He is a friend I love to spend time with. Harry is not a character to me, he is a real, live, three-dimensional friend, whose company I enjoy and whose opinions I obviously value. I know Michael Connelly created him, and I also know he created Harry so well that he comes to life for me. Harry's likes and dislikes affect me. His moods are contagious. When he's in trouble, I'm with him, covering his back as I know he would cover mine. I cheer for Harry and sometimes, when I listen close, I hear him cheering for me. Why would you write a novel and not populate it with characters who come to life for readers? Characters like, Harry Bosch, Joe Pike, Atticus Finch, and Tom Cutter**. Sigh of satisfaction when I got the end, Bert! Thanks for another great read. Yes, why would anyone write a novel with flat characters? Better yet, why would anyone read one? I have only put down one book after starting it, and it was because I could see the writer, not the characters. I love to make you sigh.